Special Containment Procedures: The shed housing SCP-2298 is to be relocated to Site-162's Euclid Wing. The containment chamber is to be monitored via security cameras and motion detectors which, when triggered, will automatically set off a medium threat level alarm. Motion detectors must be turned off remotely prior to entering the containment chamber. Routine surveys of SCP-2298 are to be conducted on a bi-weekly basis, and any significant changes in behavior of SCP-2298-1 instances is to be reported. Description: SCP-2298 is a city block which occupies the confines of a small shed in █████, Italy. The exterior of the shed, constructed of concrete, wood, and plaster, has a length of 3 m and a width of 2.4 m. As one enters the shed, they will find themselves exiting a building within SCP-2298. The block in question consists of two roads (Planck Ave and Luminol Rd) which intersect at the center of the block, and 14 buildings of varying sizes and purposes. These include apartments, retail stores, a small supermarket, post office, and ██████. All materials1 in SCP-2298 are composed of plastic, rubber, latex, and/or resins. SCP-2298 covers a space of 94 m2, and appears to be "boxed in", as the edges of the city block lead to solid plastic walls painted to look like a skyline. Further analysis reveals that the sky directly above SCP-2298 is also a ceiling placed 2 km above ground level. When SCP-2298 is devoid of human activity, the sky has been noted to change based on the time of day. SCP-2298-1 instances designate the 37 sentient polyester resin mannequins which inhabit SCP-2298. SCP-2298-1 instances do not appear animate while humans or any recording devices are inside SCP-2298, but will change location at unknown intervals when the city is unobserved. 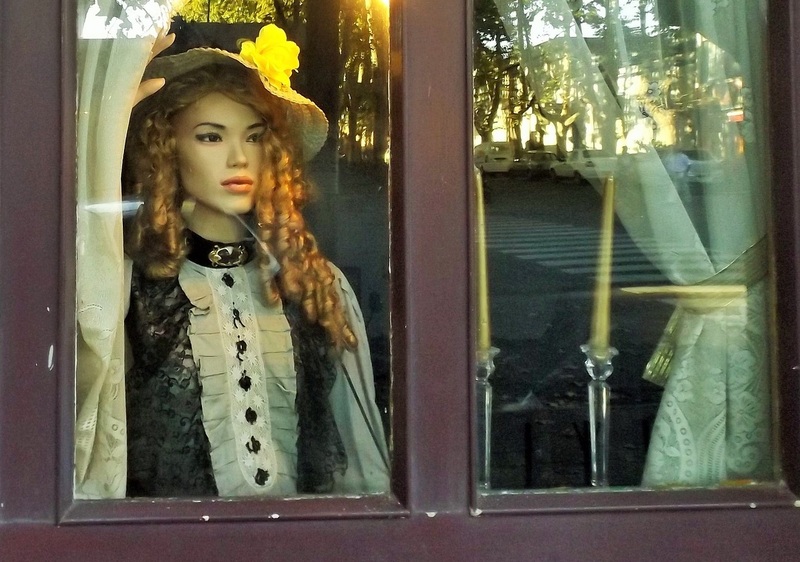 The mannequins display only a vague awareness of human intervention within the city block (See Addendum). It is theorized that when the city is observed, time within SCP-2298 is paused2. Long term study of SCP-2298 and SCP-2298-1 instances have shown patterns within individual mannequin behavior, suggesting that each one has a unique personality and even interpersonal relationships. Addendum 2298a: On ██/██/██, contact with SCP-2298-1 instances was attempted through a survey by the Foundation front company S&C Plastics. Twenty-six copies of the survey were delivered; text is below. Hi. We're a research team at S&C Plastics conducting a product survey. We would greatly appreciate it if you answered our questions and returned this letter to your local post office. Doing so will allow us to provide a better experience with our products, and give you as the consumer more value with every purchase. Question 1: What is your full name? Question 2: Are you male or female? Question 4: Have you ever heard of S&C Plastics? Question 5: Would you consider buying S&C Plastics products in the near future? Question 6: What is your current town of residence? Question 7: On a rate from 1 to 10, how well do you rate your reaction to change? Question 8: Do you believe in the paranormal? Please explain why or why not. Question 4: Have you ever heard of S&C Plastics? Nope, never. Question 5: Would you consider buying S&C Plastics products in the near future? Probably not. Question 6: What is your town of residence? ███, NH, USA. Question 8: Do you believe in the paranormal? Please explain why or why not. Yes. There was this one time a few years ago when everything in my friends house got moved around during the night. Spooky stuff. Question 2: Are you male or female? Female. Question 4: Have you ever heard of S&C Plastics? No. Question 5: Would you consider buying S&C Plastics products in the near future? Maybe?? I'm not really sure what you make. Question 6: What is your current town of residence? It's ███, New Hampshire. Question 8: Do you believe in the paranormal? Please explain why or why not. Yup. It kinda feels like everyone in town has a story about how something weird and unexplainable has happened to them. Question 1: What is your full name? Not comfortable sharing this with you. Question 2: Are you male or female? Male. Question 4: Have you ever heard of S&C Plastics? Yes. Nice acronym, btw. Question 5: Would you consider buying S&C Plastics products in the near future? No, ‘cause that company doesn't exist. Of course, we both already know that, don't we? Question 6: What is your current town of residence? ███, NH. Why do you need to know? Question 7: On a rate from 1 to 10, how well do you rate your reaction to change? depends on the kind. Question 8: Do you believe in the paranormal? Please explain why or why not. The door opens both ways. Following this, Containment Procedures were heavily revised. 1. Including both organic substances such as food, and technology such as personal computers. 2. Relative to instances of SCP-2298-1. SCP-2298 and instances of SCP-2298-1 appear frozen in place, but time does not actually stop.